The Yamaha CFX Grand Piano is the result of 19 years of research and development, not to mention discreet evaluations provided by pianists of international renown. The Yamaha CFX has become the flagship model and crown jewel of the Yamaha CF series of hand-crafted full concert grand pianos, in place of the previous concert grand champion, the CFIIIS. The CFX has a distinguished and imposing presence. It stretches 9 feet long, is made out of the finest materials, and skilled factory craftsmen have overseen every stage of its construction. The high level of care and quality control that goes into its making can be sensed in its outstanding range of tonal expression and its ability to produce the most subtle auditory details. The materials that go into the construction of a Yamaha CFX Grand Piano are nothing less than the best that are available to the factory. • The ribs, soundboard, and bridges of the instrument are crafted out of European spruce, which has been found to possess exquisite grain structure, strength and resonance. This wood must also undergo a lengthy seasoning period to assure its impeccable form before it is used in building the various piano components. • The fine wood hammers of the piano are covered with high-grade felt. • The bass strings are made out of solid copper that has been wound by hand. • The piano action rails are constructed out of aluminum alloy capable of great endurance and speed. • The piano's plate is made out of quality cast iron that is produced at a foundry operated by Yamaha itself to ensure its suitability for piano construction. 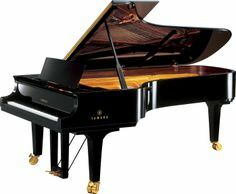 • The piano key action mechanism is engineered to the greatest precision and accuracy. • Other key components of the Yamaha CFX are its Soft-Close fallboard, the patented Humid-A-Seal pinblock, the Ivorite keytops with WPC sharps, and the hardwood reinforced key frame. The combination of all these elements can only result in a magnificent instrument worthy of being played at the most notable of performance halls all over the world. This grand piano is designed to be an instrument that meets the exacting standards of the top international concert pianists. To pass muster, it needs to be of more than satisfactory quality. It needs to prove its exceptionality in every aspect of its operation. The Yamaha CFX Grand Piano is as close to a perfect instrument available to the concert pianists of our time.